Allergens: Wheat, Egg, Egg Yolk, Milk, Cream, Soy bean. May also contain sesame. 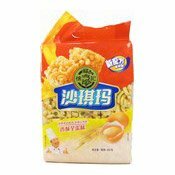 Ingredients: Glucose Syrup, Wheat Flour (25.69%), Palm Oil (Contain TBHQ), Egg (16.02%), Sugar, Egg Yolk Powder (3.08%), Milk Powder, Cream (Contains Lactose, Soybean), Raising Agent (E500[ii]), (E450[i]), Salt, Flavouring. 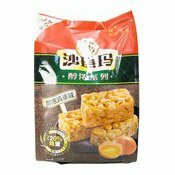 Simply enter your details below and we will send you an e-mail when “Egg Cake (Sachima) (徐褔記醇浓鸡蛋沙琪玛)” is back in stock!